Present-It.com is the online home for multimedia presentations. Registration gives free access to Knovio, the award-winning online presentation tool. Present-It.com amplifies the reach of anyone who wants to inform, teach, explain, advocate, or inspire with multimedia presentations. A new free public website for creating, sharing, and discovering multimedia-enhanced online presentations launched today, and it's called Present-It.com. Unlike other slide-sharing services, Present-It.com showcases presentations that feature the author's voice and image, and incorporates the award-winning Knovio application for instantly creating and publishing multimedia presentations. It's created and operated by KnowledgeVision Systems, the leader in online presentation technology and tools. 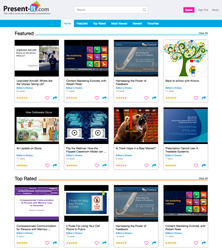 "Present-It.com dramatically amplifies the reach of anyone who wants to inform, teach, explain, advocate, or inspire with multimedia presentations," said KnowledgeVision Founder and CEO Michael Kolowich. "Presentations posted to Present-It.com will be immediately available to search engines and a global audience on the World Wide Web." Visitors to Present-It.com will be treated to a rapidly growing set of multimedia content on ideas and topics ranging from new technology to breakthrough health concepts to leadership development. All of the content is created with Knovio, a free online presentation tool that's available to every registered visitor, and other KnowledgeVision online presentation tools. Knovio is an easy-to-use browser application that helps people create instant multimedia stories by adding their voice and image to PowerPoint, PDF slide decks, and collections of photos and images. It is also available as a free mobile app for the iPad, iPhone, and late-model iPods. "Since Knovio completed its beta test period in April, 2015, its use has exploded across the business and education landscape," said Kolowich. "More than 160,000 users have already signed up to Knovio, and Present-It.com now gives them a megaphone to amplify their message and stories." Knovio is used on more than 1,400 college and university campuses, and in thousands of businesses in 165 countries on six continents. Knovio users will now have the option to post any presentation they publish to Present-It.com, where it will be viewable and searchable by a global audience. In addition, visitors to Present-It.com will be able to sign up instantly to a free Knovio account to make their own presentations and share them with the world. KnowledgeVision Systems is the leader in multimedia online presentation technology and tools. Its Knovio platform is used by more than 150,000 individual users around the world. Its KVStudio editions are used by hundreds of companies for learning, marketing, sales enablement, corporate communications, and investor relations. And KnowledgeVision technology is embedded in an increasing number of products and services offered by third-party companies. Located outside Boston, Massachusetts, KnowledgeVision is backed by GrandBanks Capital, RAND Capital, and a group of individual investors. View a demonstration of KnowledgeVision's products and platform at http://www.knowledgevision.com/demonstration.